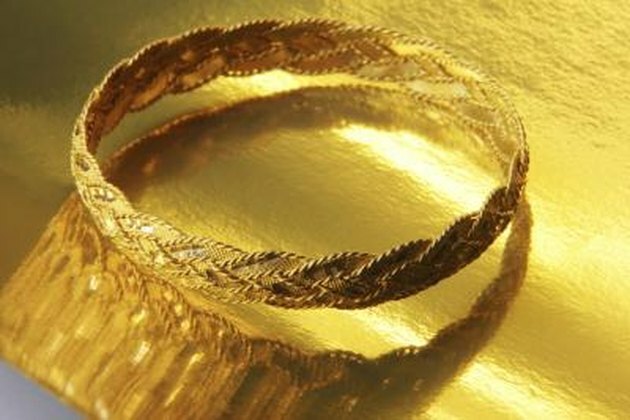 Egyptians believed the healing powers of gold could cure all manner of physical, mental and spiritual ailments. Romans used gold preparations for treatment of skin lesions and sores. It is believed that Cleopatra wore pure gold for a radiant complexion. In ancient Chinese medicine, gold was the secret to youthful skin. Today, gold leaf is used in the treatment and rejuvenation of skin conditions. The application of gold compounds to medicine, called chrysotherapy, reduces inflammation beneficial in the treatment of a variety of diseases, but this therapy often causes adverse gold-related skin reactions. Allergic reactions to gold are rare but can result from direct skin contact. According to a publication in the “Daily News Analysis,” some people display allergic skin responses to gold jewelry or dental crowns, says Dr. Thomas Fuchs of Goettingen University Hospital in Germany. After a survey of various dermatological clinics and hospitals, he concluded pure, unalloyed gold can trigger allergic reactions. The degree of allergy varies from immediate dermatitis on hands and feet from contact with gold items to reactions only after many years of skin contact. Chrysotherapy is a successful treatment for rheumatoid arthritis, but dermatological reactions to gold limit therapeutic usage. A study done at Tel Aviv Medical Center reported in “Annals of Rheumatic Diseases” was discontinued when patients given gold salts reacted adversely with symptoms including gold-induced skin rashes. After the study was stopped, coincidentally the patients with skin rash experienced remission in their rheumatoid arthritis. The patients without skin rash did not. Gold is thought to have antibacterial properties and to help transport oxygen molecules into the skin for cell renewal to treat ulcers and inflammatory disorders of the skin. Some skin-healing benefits of gold were demonstrated by an in vitro chrysotherapy study by the University of Miami School of Medicine, which found that concentrations of gold administered in skin inhibited prostaglandin synthesis. “The Journal of Investigative Dermatology” reported that the findings suggest gold is beneficial in treating autoimmune diseases and inflammation, and inhibits skin enzymes involved in blister formation.